LAST MINUTE SUPER SELL-OFFS!!! We'd rather have guests enjoy our beautiful oceanfront/ocean facing condo at an affordable price than leave it unoccupied! April 16-20 '19 NOW ONLY $199/nt plus tax. Min. 3 night stay. Please add $20/nt per person plus tax if your party is greater than 4 persons. Scoop up a last minute deal based on remaining availability!!! Well appointed & spacious oceanfront 1-level (no stairs!) licensed Vacation Rental condo in Tower building at Kawama Yacht Club, a gated resort with 24x7 security on the Atlantic Ocean! Great SW exposure & beautiful sunsets. Private keyed elevator access to our condo. Separate private laundry room in the condo! Beautiful Oasis pool for the exclusive use by Tower guests. 2 other pools and a salt-water lagoon for swimming. SONY 46' FP LCD HDTV and new entertainment system in Living Room. Brand new flat screen tv's in the 2 bedrooms! NEW Free Comcast Xfinity WiFi and TV service as of 2019. FREE Continental North American Phone Calling!! Brand new resurfaced night lit twin tennis courts in purple and green colours (see photos). 4 tennis racquets and balls are available in our laundry room, as is a fishing rod/some accessories, beach chairs, beach toys, coolers, pool noodles etc. Brand new Pirate Ship themed childrens' playground is available for use! Please check our Rates section for rental rates including last minute sell-off specials. Please check our on-line calendar for up to date condo date availability and feel free to contact us for further information. Also, please view our video, which shows how beautiful our Tower condo and the Kawama Yacht Club is! 3rd floor Tower condo w/ balcony offers one of the best ocean & marina views of all Tower units!! 1322 s.f. living space in an open plan format all on one level. Just remodeled with upgraded kitchen including granite counter tops & glass mosaic tile back splash, granite topped bathroom vanities, new high-end living room, dining room & bedroom furniture & tasteful tropical décor. New SONY TV, DVD stereo & new AC systems. Queen bed & crib in master bedroom. 1 Queen, 1 Double & 1 twin single bunk bed over double bed in 2nd bedroom. Both bedrooms have new flat screen tv's as of August '18. You need not look any further! 100+ positive feedbacks! This is one of the most popular condos at Kawama, based on all our positive feedback from previous renters! Please visit our HomeAway Guest Comments section and see how thrilled our 100+ previous renters have been! This feedback from renters like you is a testament to how beautiful our Tower condo and Kawama Yacht Club is, and how attentive we are to you as our guests !!! We are owners as of March 2007 and are focused on providing you with an exceptional vacation experience. We therefore appreciate your feedback!! Theatre of the Seas about 30 min. south. Kawama Yacht Club is close to many excellent restaurants, grocery stores and shopping. Upon reservation I will send you detailed information regarding local restaurants, shopping etc. to help prepare you for your stay! Hi! We're the Elia's... George and Marianne and our children Nicolas, Danielle and Kirsten. We're the proud owners of this beautiful Tower condo overlooking the yacht club, and the Atlantic Ocean, as shown in the photo above looking back from the 400' Esplanade to our Kawama Tower building. See our photos for view from our balcony!!! Check out our Video Tour. It will give you a good idea of our beautiful condo, it's location relative to ocean views and the Kawama Yacht Club property. Key Largo is close to both Miami and Ft. Lauderdale International Airports, and is a fantastic island from which to explore the Keys. Key Largo was our choice as we wanted an oceanfront location, without any noise from the Intercoastal Hwy (US#1). All amenities and attractions are so close, and the Keys atmosphere prevails. Location is the best of both worlds! Kawama is situated well off of US#1, and is surrounded by the Atlantic Ocean on one side, 'parkland' with John Pennekamp State Park just to the north and a bird sanctuary to the southwest. Very quiet and relaxing location, with beautiful professionally maintained grounds. Yet it is so conveniently located to the major shopping areas and restaurants in Key Largo. Master bedroom ensuite 5-piece bathroom is on the side of the Yacht Club Marina and Ocean. New high end wood vanity with Travertine stone bowl and single spout faucet and matching mirror. Tastefully decorated with tropical accessories. New towels and amenities. New Waterpic shower head gives choice of showers. Second bathroom also features new granite topped vanity and matching medicine cabinet, and is also decorated in a tropical theme. New funky shower head with water that automatically changes color based on water temperature. This is a hit with the kids! Plenty of towels, including beach towels. Separate, private laundry room also is part of our condo unit. crushed-coral beach on upper level (as shown in photo). Natural ocean bay area below. right at Atlantic Ocean, great views of the ocean. FREE Continental North American calling just added July '15!!! Cordless phone and answering machine available in our condo. New air conditioning unit installed in 2016. Gas heating, although climate in Key Largo is generally warm/hot so heating is very rarely required. Abundant bed linens. Includes new beautiful bedding decor for second bedroom (not shown in our new Video). Abundant bath, beach and kitchen towels also provided. Our condo features separate and private laundry room with washer, dryer and storage area. Brand new state of the art Comcast Xfinity WiFi installed February '19 in our condo unit! New July 2012, with ice maker. Still working great! Plus brand new electric BBQ (2015) on balcony. Variety of spices, staple items. Abundant. Tropical themed dishes. New pots and pans. Brand new granite counter tops, high-end opalescent mosaic tile back splash, new stainless steel sinks, faucet and range hood, pantry, breakfast bar, new recessed ceiling with cornice moldings, new lighting including 3 new artistic glass pendant lights (not shown in photos). Tropical themed dinnerware. New Hi-Definition 48' Wide screen Sony Flat Screen TV in living room; additional TVs in the 2 bedrooms. New Comcast Xfinity TV (2019) for expanded TV listing selections. Some novels, lots of magazines. Local publications also available in the book holder in the living room. some, including beach toys and pool noodles, large floaty mattress, etc. These can be found in the laundry room. Original 'Key Largo' video plus some others. You must watch Bogart in this classic! Kawama's property is beautifully landscaped and professionally maintained. 1 of the best views in the Tower. Overlooking ocean and yacht club. Great Southwest exposure! Sand toys, pool noodles, rafts, cooler, beach chairs provided. Also tennis rackets provided. Twin courts, newly re-surfaced in 2018 to a high standard. 2 racquets provided in condo. Complimentary use. These can be found in one of the second bedroom's closets or laundry rom. Nearest golf course is in Florida City, which is about a 30 minute drive from the condo. 2 large elevators and wide hallways are wheelchair accessible. Brand new tiled, heated, in ground salt water pool with lounge chairs and seating areas just re-built in Feb. 2019 for the exclusive use of Tower condo owners and guests. Beautiful new 'Oasis' salt water, heated pool for exclusive use of Tower guests only. 2 addit'l in ground, tiled and heated pools also available for use. Salt water lagoon with 2 swimming platforms and man-made sand beach also on grounds. Gated 30+ acre resort with 24-hour patrolled security. 2 wheel chair accessible elevators. New state of the art Comcast Xfinity WIFI and TV (2019). NEW unlimited free local AND Long Distance calling within N. America. New air conditioning system 2016. New SONY BRAVIA 46' Flat Panel High Definition TV, stereo system and CD, new Blu Ray DVD player. Separate, private laundry room with full sized washer and dryer for your exclusive use. Refrigerator with freezer and ice maker. Microwave, full-sized oven. New kitchen pantry, new granite topped kitchen island. New deep twin kitchen sink with telescopic faucet. New kitchenware in tropical theme. 4 tennis rackets, swim and beach toys available in our condo for your use. Some children's and adult books and games. We loved staying in this condo: very spacious, kitchen was well stocked, great view from the balcony and even beach toys, chairs and umbrella. The resort had a lot of extra ammenities with several pools, salt water lagoon, playground and tennis courts. Would definitely recommend! Enjoyed our stay in Key Largo! Just a short walk past marina to a stunning 180+ view of the ocean. thanks! Thanks Brian for your positive review. Great to hear you enjoyed your stay. Indeed, the beach area and 200' jetty just beyond it are steps away. Many people enjoy the panoramic views from the jetty, especially the sunsets and sunrises. Great location, fit our family well. The property was in a convenient location, quiet complex. The propery was as described and fit our family of 6 well. We had a great time there. Thanks Kris for taking the time to post your positive review. Wonderful to hear all 6 of you had a great time there. Yes, our condo is quite spacious at 1250 s.f., and is well equipped for larger families/groups. 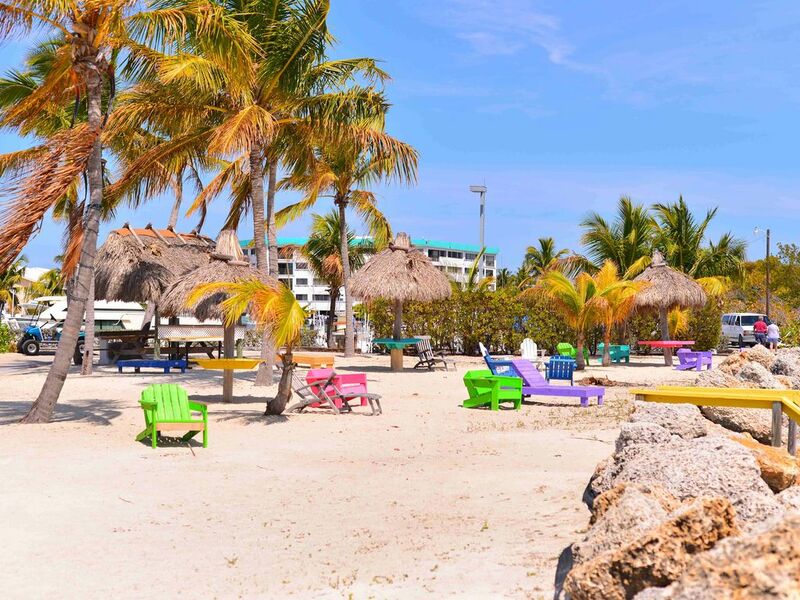 Kawama is quietly nestled on the ocean coast close to downtown Key Largo which offers many amenities of home, great restaurants, and nearby attractions. We flew into Fort Lauderdale airport, and spent day in South Beach Miami on way down to Key Largo. Condo is much larger in person than in photos. Very spacious and comfortable. The complex is amazing with many options for fun. We spent a day driving down to amazing Key West. On way back to airport, we spent day in Hollywood Beach (just south of Fort Lauderdale). Key Largo was a great spot to stay in to have access to all these wonderful towns. I would recommend Key Largo and this condo! Thanks Jill for taking the time to post your review. I'm pleased to note that you had a great vacation and appreciated our spacious condo. Indeed, at about 1250 s.f. our condo is large and its open concept design fanning out to the ocean on the front provides great views of the ocean and marina. Our condo's location in Key Largo provides a good spot for exploring The Keys, and is not too far from Fort Lauderdale and Miami airports. Our condo is well stocked with everything one would need for their vacation. Just pack your bags and enjoy! If you like sun, swimming, fishing and good food, this is the place to be. The is a great location in the Tower at Kawama Yacht Club. Also, the people here are remarkably friendly. Thanks Ken. Great to hear you had a fantastic vacation. Indeed the location of our condo is very good, being close to everything that anyone would like to do when in the Florida Keys. And all the amenities of home are closeby, shopping, restaurants etc. Our condo is equipped with everything you'll need for a great vacation. Just pack your bags and enjoy! CHECK OUT OUR VIRTUAL TOUR VIDEO! Refer to our Calendar and Rates section for availability and seasonal pricing. Check out our abundant positive renter feedbacks and our new Virtual Video!!! Kawama Yacht Club is located in Key Largo, the northern-most & largest island of the Florida Keys. Only a scenic 1 hour drive south of Miami. This beautiful 30+ acre gated resort has 24 hr security & is set on an unspoiled peninsula jetting into the Atlantic Ocean between a bird sanctuary to the south & John Pennekamp Marine Coral Reef State Park to the north. The on-site Molasses Reef Marina caters to individuals wishing to bring their own watercraft, with complimentary boat launch & storage facilities for renters. Slip rentals are available. Enjoy spectacular sunsets and sunrises from our 400' esplanade!! Key Largo is known as the scuba diving & snorkeling capital of continental North America! Enjoy watersports, casino or sunset cruises & a variety of fishing charters nearby. Or relax in 1 of 2 in-ground heated pools. Visit the 100' swimming lagoon with 3 swimming platforms, small beach & which is stocked with tropical fish. Play tennis. Kids will love the playground. Fish from the Kawama jetty!!! Great fishing is available all around the Florida Keys!!! Golf: Semi-private golf is available in Homestead, about a 30 minute drive north of Key Largo. I understand that golf club rentals are available. ***PLEASE NOTE*** RATES QUOTED ARE $USD. An additional fee of $20/person per night will be added if more than 4 persons are in your party. A Kawama Gate Form will be provided upon booking to identify persons in your party, as well as car(s) and any boat. Note that if you plan on bringing a boat into Kawama you must provide proof to the Kawama Security Gate of a minimum $300K liability insurance on your boat/trailer. $100 post-stay cleaning fee will be added. If your checkout date is on a statutory holiday, the post-stay cleaning fee will be $150. Absolutely no smoking allowed in the condo. Absolutely no pets allowed. Hanging of towels/clothing on balcony railing is prohibited. Please check on-line calendar for up to date availability. Any rental fees paid > 60 days prior to your planned arrival date are refundable at 100%. Any rental fees paid 30-60 days prior to your planned arrival date are refundable at 50%. Any cancellations made <30 days prior to your planned arrival date are not refundable. Having said this, in the event that you need to cancel your booking I will attempt to rent out the dates reserved for you, and refund you accordingly based on rental fees obtained (may be lower than what you paid due to a "Sell-Off" scenario. I will do my best to re-book dates in this circumstance.